The plans are coming together for the 2017 Convention of the Souvenir Building Collectors Society to be held in Chicago, IL on August 25-26-27. Click here for Mark and Mike’s update letter. Here is the general outline of the three days. EVENING: Annual MEET & GREET, aka Reception (at convention hotel) and Show & Tell.HELP THE ORGANIZERS PICK A THEME, forward your suggestions to 2017 SBCS Convention Committee by clicking here. EARlY AM: Chicago River Cruise – 50+ iconic Chicago buildings on view. LATE AM: SBCS Business Meeting and Swap Meet (convention hotel). Some of the buildings from Bob Kneisel’s bequest to the Society will be available in the Swap Meet and others in the evening’s auction. EVENING: Saturday Night Banquet (off-site venue) Raffle, Auction and Merriment! 2016 SBCS Convention Commemorative. Hollyhock House. Mfg. InFocus Tech. Hollyhock House. SBCS 2016 Convention Commemorative by InFocus Tech. Hollyhock House, Barnsdall Park. View through Courtyard to Living Room. Note the Hollyhocks in the garden. The 2016 Souvenir Building Collectors Society Convention in Los Angeles is history. Yet no one who attended will forget the camaraderie, the tours, the member exhibits, the swaps, sales, raffle and auction action. The 2016 Convention Commemorative, made by InFocus Tech, of Hollyhock House will keep the memories bright. Besides the Commemorative Souvenir Building of the Frank Lloyd Wright designed Hollyhock House in Barnsdall Park, Los Angeles, a handout listing souvenir buildings and monuments in the LA area was distributed. Click here to download a pdf of the listings. The 2017 Convention will be held in Chicago in October. Planning is underway and updates will be posted on this website on the 2017 Convention page. Keep watching. Following the SBCS Convention tour of the Florida Southern College Architectural District, a collection of Frank Lloyd Wright buildings, it was observed that a miniature of the Annie Pfeiffer Chapel had been created as a building fundraiser some time in the 1930s. Steven and Ethan C have a one in their collection. 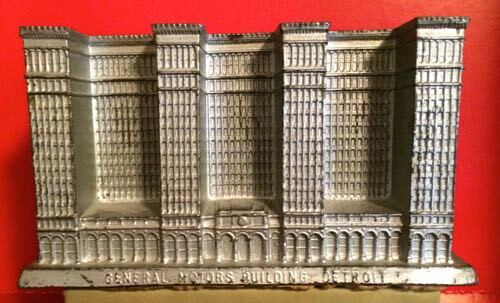 It was purchased about 2010 from a collector in Atlanta who would only part with one of a pair of bookends. Annie Pfeiffer Chapel bookend single. Width – 6 1/2”, Ht. 5 1/2”, Depth – 1 1/2”. Private Collection. Community Collections: A Sampling of Souvenir Buildings. View at the City Reliquary Museum. Exhibit closes in September 2015. Photo courtesy of Anna Grant. 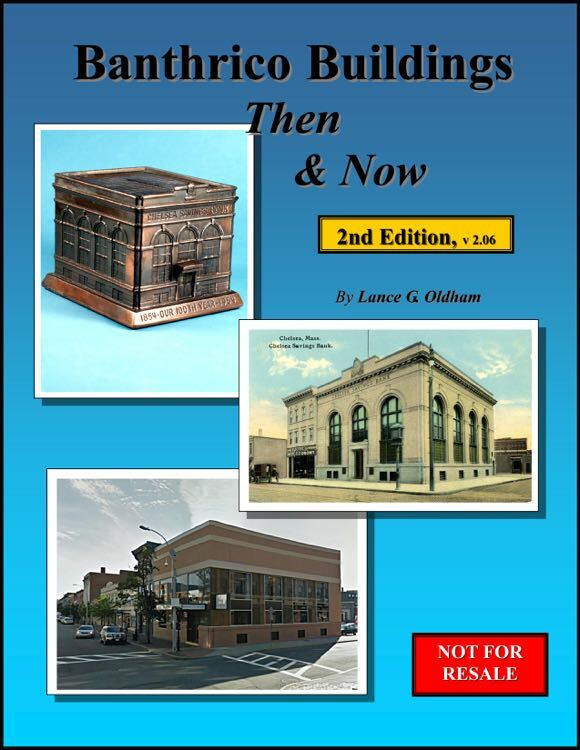 The City Reliquary Museum in Brooklyn, NY is showcasing in their Community Collections exhibit: “A Sampling of Souvenir Buildings” from the collection of SBCS President Joe Kopitz. They can be viewed in person at the Museum, on the City Reliquary Museum Facebook page and on the Souvenir Building Collectors Society Facebook page. Of late, the Souvenir Building Collectors Society Facebook page has been hosting some lively discussions and a spate of interesting souvenir building photo postings requesting and receiving identifications. Carolyn C. kicked off these discussions on a Wednesday some weeks ago with a “Where Is It Wednesday?”.This has morphed into “Who Has It Wednesday?”, “and “What Is It Wednesday?” with resulting ID’s and pictures of the actual buildings. Where Is It Wednesday? Identified as Dormition Church, Kondopoga. Friday Finds: Resin Replica of Maine-Montparnasse Tower, Paris. Become a member of SBCS and join the conversation. Click here for Membership Information.